The "base" of our team consists of Kirsi & Timo and Kirsi’s sisters Saija & Sari. Our dog activities and also dogs are divided into three adresses. Kirsi & Timo live in the southern Finland and Kirsi’s sisters Saija & Sari live in South Ostrobothnia. All our dogs are living as beloved family members in our homes. The dogs are not just a hobby but a way of life. Whiptails prefix was accepted on 23rd September, 1996. 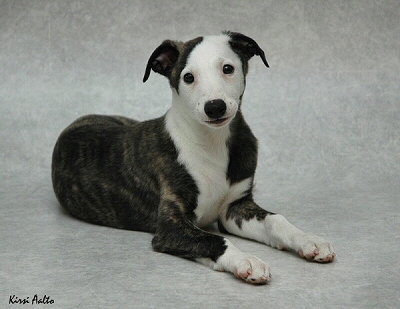 We breed show lined Whippets in very small scale in Finland.